There are many ways to imagine health. In functional myodiagnostics (FMD), we work with the assumption that every illness can have structural as well as chemical and emotional causes. An isosceles triangle, Triad of Health, means balance or homeostasis, as an expression of optimal health. With the functional myodiagnostic muscle test, disorders or weak points in the body can be identified surprisingly well. The method was first introduced in 1964 by the American chiropractor George Goodheart and further developed in the last 30 years as an interdisciplinary diagnostic and therapeutic method for functional disorders. The functional myodiagnostic examination uses the manual muscle test as a "yardstick " to differentiate normal from pathogenic or morbid conditions in terms of a functional neurological examination. 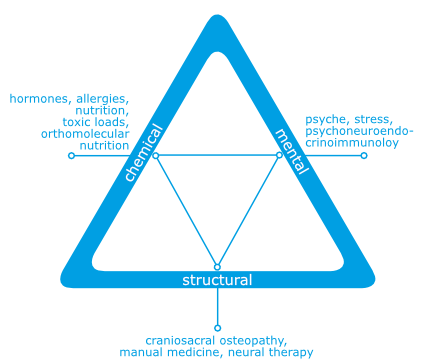 For people with severe, chronic health problems, shifts in the Triad of Health Triangle can be found on 2 or 3 sides. Sometimes a problem starts on one side of the triangle and then over time can involve all aspects of the triangle. Each side influences the other sides of the triangle, identifies causal factors of health problems and aids in the therapeutic approach. In our approach, we see the human body in a dynamic equilibrium on a continuum from health to disease. The earlier we recognize psychosomatic symptoms and take them seriously, the better and more efficiently, can we decipher their message and find solutions before symptoms turn into disease and become more difficult to access. We help our patients to reduce the stress on each side of the equilateral triangle. To this end, we must provide you with the tools to strengthen your resistance to unfavourable influencing factors. In order to be credible, we must not only "preach" things, but also live them. We have ourselves tried and tested all the methods and approaches we offer for a long time and we continue to apply them as required. Only in this way can we be effective and convincing as "role models".